Packing for the Marathon somehow seems more challenging than getting ready for a 3 month trek. How to pack the essentials, but stay light? 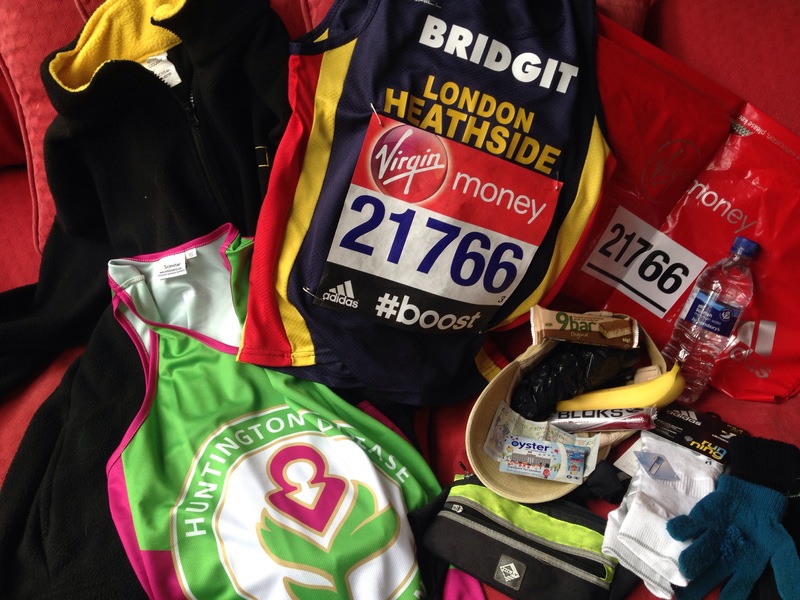 Here are some of my essentials : mismatched gloves, an old fleece & hat for pre race warmth, but can be tossed near the start (note that all gear is collected for charity shops ) . Bin bag to stay dry if raining ( rain is predicted ) . Water, banana, cereal bar for snacking. Shot blocks energy chews for fuel while racing. Garmin watch to manage pace (hopefully, although I rarely look at my watch when racing). Travel card and 5 pounds mad money. Race vest & number ( 21766). Tissues and sanitizer for the camping element of racing. Fresh clothes and Birkenstocks for post race comfort! Jam it all into the back pack – done. Now off for an easy dog walk to settle the nerves and give the legs an gentle outing. Why does Race Training sometimes zap the joy?